Not read it in years, but Finbar Saunders is legendary, with the Postie being a personal fave. Sid the Sexist never fails to amuse either. I always liked roger mellie. Last Viz related thing i clapped eyes on, was the Game (on ST i think) and that was years ago, no..tell a lie i was given 2 Viz DVD's.Fat Slags and Roger what's his face (man on tellie) gave'em away after viewing mind. Used to pick up the comic years ago on the off, never a regular reader mind. I tend to just buy the compilation annuals these days, The Works sell them cheap and you don't get any of the crap. I also have the Das Krapital edition of the Profanisaurus, the Top Tips book and the Roger Mellie DVD. Read it as a student, but not lately. Some of it was funny. I particularly liked the one-off parodies of celebrities and TV shows. And the spoofs of other comics little-boy-fantasies or flat-out unlikelihood like Gilbert Ratchet, Tinribs, Suicidal Sid, etc. And of course Mickey's Monkey-Sp*nk Moped. The tragic nature of strips like Biffa Bacon coming from an abusive family is a nice touch, but I don't find it funny. Nor the really revolting stuff like 8-Ace and Fru T. Bunn. 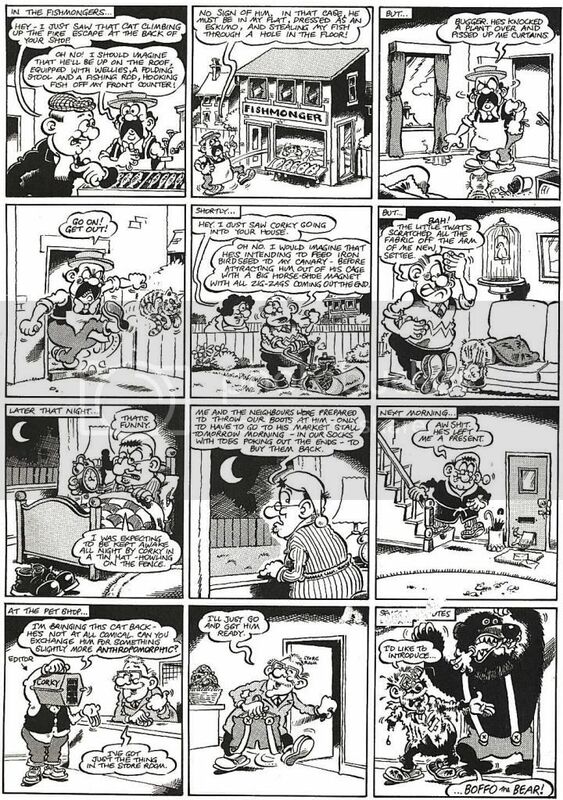 Fat Slags can be a bit too much, but I reckon Sid the Sexist is consistently good. Profanisaurus is hilarious too, but it's got so big now they leave out loads of terms in the print editions so that the old chains of cross-references you used to find are broken. Best strip ever had to be the tribute to Ronnie Barker. Hard to pick a favourite character, but Terry Fuckwitt's a strong contender for it. Those stories started out as just your general "idiot" character, but soon developed into something genuinely surreal. My favourite "one-off" character would be the one that got DC Thomson very upset, this one being right on the front cover! So if you haven't read it for a few years, that's what it's like nowadays. Terry Fuckwitt and Roger Irrelevant were easily my favourite characters. Mr Logic and Finbar Saunders for me. 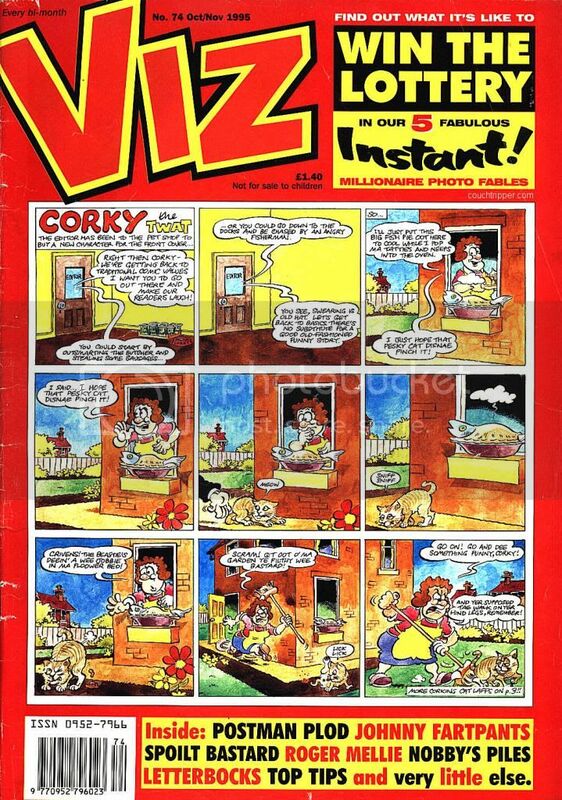 Strangely I havent read Viz for a good few years now yet the missus bought me the latest annual for Christmas. While it isnt a bad read 'It aint as good as it used to be'. Or am I just getting old? Quite a few that where wrong (not politically correct) any idea what these where called? Rat wearing a cap and tracksuit, he used to rob everybody and spend the money on drugs, and spoke in text speak/F wit.. Always ended with somebody saying your infringing that scumbags uman rights and he'd get sent on Holiday to Disneyland as punishment..
Well, your Victorian strip was just called 'Victorian Dad'. I can't identify the rest of your unknowns, I assume they're from a later period in its life than when I read it. Shame, as some of them sound quite funny. I'm really surprised at a Viz reader finding the content 'too rude' though. That was rather the point half the time. Shinobi wrote: Rat wearing a cap and tracksuit, he used to rob everybody and spend the money on drugs, and spoke in text speak/F wit.. Always ended with somebody saying your infringing that scumbags uman rights and he'd get sent on Holiday to Disneyland as punishment.. The rat in the tracksuit is Rat Boy, initially introduced as Tasha Slappa's younger brother. As for Desperate Dan... Hmm! There was a one-off thing, years and years and years ago, called Desperately Unfunny Dan, but that's all I can think of there. Harold and Fred (They make women dead) is about Harold Shipman and Fred West living next door to each other, both trying to beat the other one at murdering the new woman on the street. Davey Jones (the artist) does LOADS of strips like this, in the style of the old Radio Fun-type comics. There's a running joke of Billy The Fish not being funny - even back in the 1980s it was only intended as a page filler. If you take the time to read it though, it's amazingly absurd. All sorts of odd cliffhangers are explained away in ridiculous ways (for example, the team are taking a bath when they notice a shark in the water - it turns out to be a harmless nurse shark). The Viz team know that no-one reads Billy the Fish, so they make it as stupid as possible. I was never a fan of Billy the Fish, and I agree, it was filler for Viz. That said it did go on to spawn a TV series which I was surprised about. felgekarp wrote: Terry Fuckwitt and Roger Irrelevant were easily my favourite characters. My favourites are Meddlesome Ratbag and The Modern Parents. Some of the old Sid the Sexist strips are hilarious also.